EYMS was struggling to counteract the rising price of fuel when it first began looking for solutions. EYMS runs over 300 buses and coaches throughout Hull, East Yorkshire, the North Yorkshire coast and onto the North York Moors. 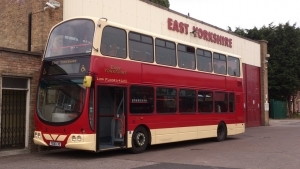 A privately-owned company, EYMS has been running buses in East Yorkshire since 1926 and provides employment for over 800 people. EYMS is the UK’s largest independent bus operator. The company has received numerous awards in recognition for consistently high vehicle maintenance standards, significant innovations, training developments, a record of constant investment, service reliability and operating excellence. EYMS was struggling to counteract the rising price of fuel when it first began looking for solutions. The team investigated a number of options but were attracted to GreenRoad because it did not need to interface with existing telematics and vehicle information. At that time, a significant proportion of the EYMS fleet did not have an Engine Control Unit (ECU). After a wide search, EYMS selected GreenRoad. EYMS initially implemented GreenRoad at its Elloughton depot and then rolled it out across the fleet. In addition, EYMS developed communications, education and policies to support driver behavior change. Its hundreds of drivers all received SAFED (Safe and FuelEfficient Driving) training. “When a new driver joins the team, they spend three weeks in training to teach them how to drive well. But most importantly they are given a GreenRoad account on day one,” said Heptinstall. GreenRoad’s solution alerts drivers when they depart from safe, smooth driving style, enabling them to immediately modify their driving behavior and encouraging them to take charge of their own improvement and take pride in their achievements. In effect they have a ‘vocal coach’ in the cab. After implementing GreenRoad EYMS achieved a 5% fuel saving which equates to $800,000 in fuel at retail prices ($370,000 savings taking the BSOG into consideration). “We built a high level of motivation and enthusiasm and everyone reaped the rewards, receiving a fuel savings Christmas bonus,” commented Heptinstall. Within a year, EYMS cut its incident rate to the lowest figure since it started tracking in 2001. EYMS achieved a reduction of 40% driver-fault accidents, a 20% reduction in passenger falls and paid out 20% less in claims.